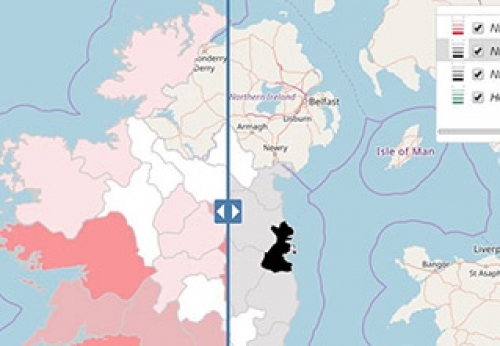 The Irish News have used Azimap to help visualise the statistics behind one of its leading stories to bring a greater depth and understand to its readers. The story centres around a topic that has been dominating the headlines in Ireland recently, an ongoing housing crisis. The crisis comes as rising prices, a growing population and a shortage of available houses has meant that younger people are being squeezed out of the property market. this has had a further knock on effect as homelessness has risen by as much as 30% across the country. The map displays the number of homeless adults by county vs the the number of vacant houses/flats in each county. Using the swipe tool, it quickly becomes apparent which areas of the country are struggling with both homelessness and vacant properties. For example, the map reveals that Dublin not only has the highest number of homeless adults in the country but also the highest rate of vacant properties. The map was created using open sources and displays results from the latest available official statistics. By embedding the map into their article, the Irish News has enabled its readers to interact with the story, easily visualise the figures behind the crisis and feel more personally involved with the story. One of the world's largest recorded landslides occurred at Zhamu Creek in Eastern Tibet.